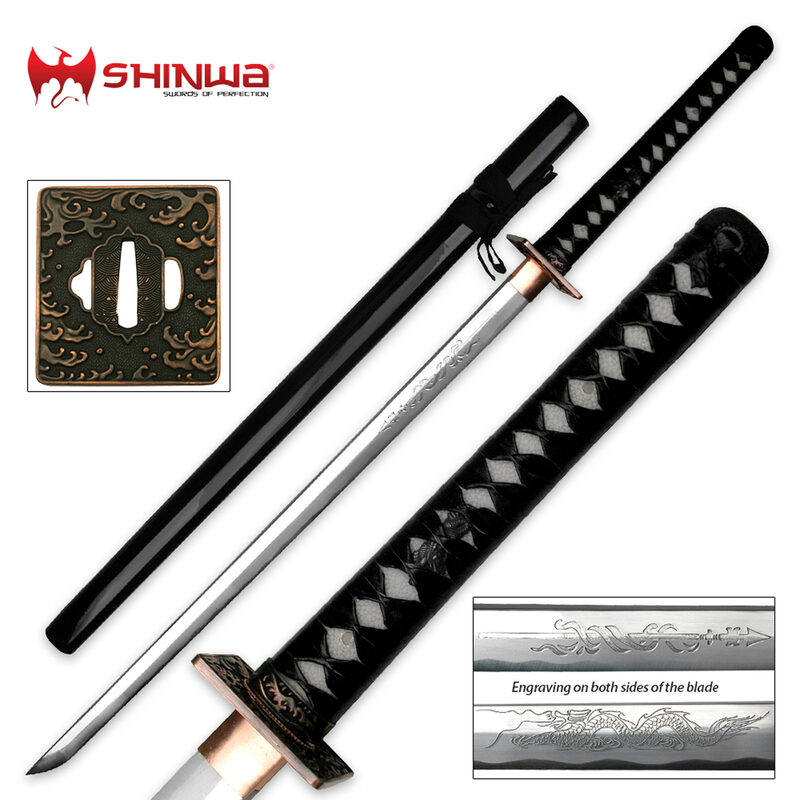 An intense custom sword creation from Shinwa. The thick tsuba can hardly contain a powerful tsunami wave. The hand brushed finish makes the waves appear to leap off the steel. An oriental dragon is engraved on the 1065 carbon steel blade. The handle is lined with real ray skin and comes wrapped in black faux leather. Secured by dual bamboo pegs, this is a full tang sword with hand honed cutting edge. This is everything you need to have a fully functional, professional, and affordable ninja sword. Perfect for both beginners and novices, this product makes a great gift for any sword enthusiast. Handmade - Extremely sharp and thick blade. Engraving on both sides of the blade. Real ray-skin handle with black faux leather cord wrap. Copper Habaki and Seppa for a unique combination of color. Full Tang construction with dual bamboo pegs. High carbon steel blade (1065). Quality Sageo and Ite wrapping. Can be disassembled for care & maintenance. Includes a black cotton sword bag (very tight fit around tsuba). 40 in. Overall, 27 in. Blade, 11 3/8 in. Handle. 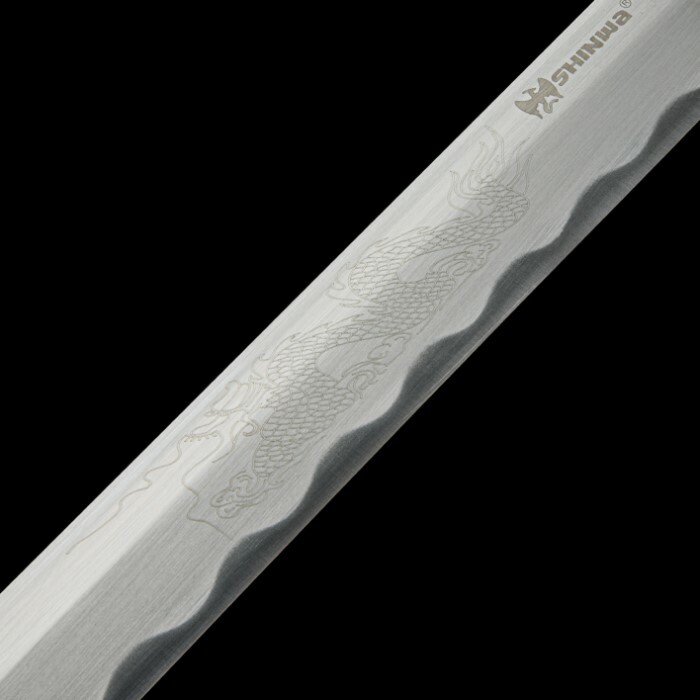 Shinwa swords are hand forged by master craftsmen with years of experience from Longquan. These master sword smiths combine modern knowledge with traditional secrets to produce superior quality swords known for their durability, sharpness, and exquisite craftsmanship. Click here for more Masahiro swords. First I must say this is a my first Shinwa. It is very beautiful. Although it did not come as sharp as I was hoping, but it is still sharp. Haven't put it to the test yet, but I look forward to seeing how it performs. This was my first sword, and I must say it will be hard to find a better sword for the same price. This sword is absolutely beautiful! Ray skin, carbon steel blade, nice handle, the guard is stunningly beautiful. I love the square guard it's not too big not too small, just perfect. And the length is perfect for someone my size(5'6,150Ibs) this is the best sword on the market for the price. I've been very happy with the products I have ordered from BudK. The less expensive sords were a great deal, but this one was worlds ahead of the others, well worth the extra money. very awesome, came sharp, the weight is excellent, by far the greatest buy i have made from True Swords. This sword is freakin sweet to the max. Its detailing is top notch its very sharp and very strong. Its weight and handling equals my personal commissioned tokijin sword that I had made for me. 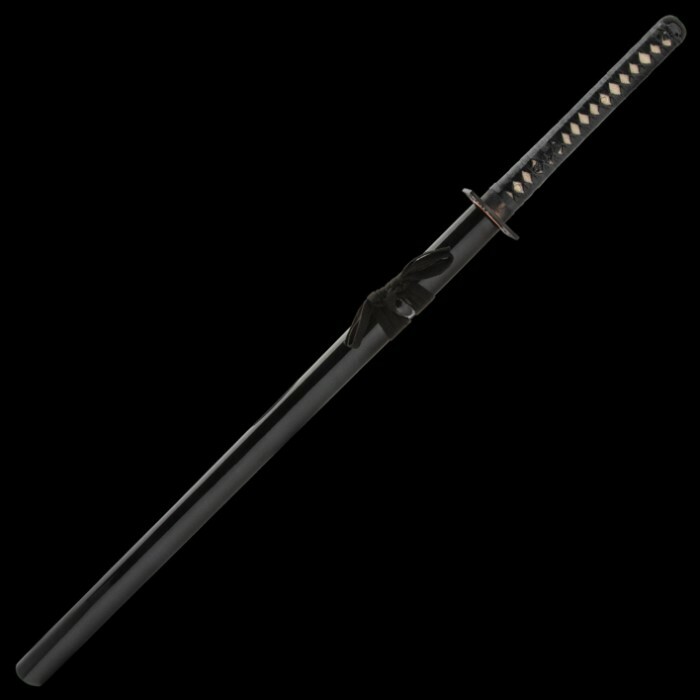 With that said if you want an epic sword that even comes close to commissioned swords this sword is the one. this is one of the most beautiful, functional swords i have ever added to my collection. delivery was very fast. beautiful blade, sharp as advertised. love the way it feels in my hands. slices thru everything i have tried it on. no damage after some serious usage today. the handle has a leather wrapped around the handle, it provides for a very firm grip. can't wait to add more swords to my collection from True Swords.